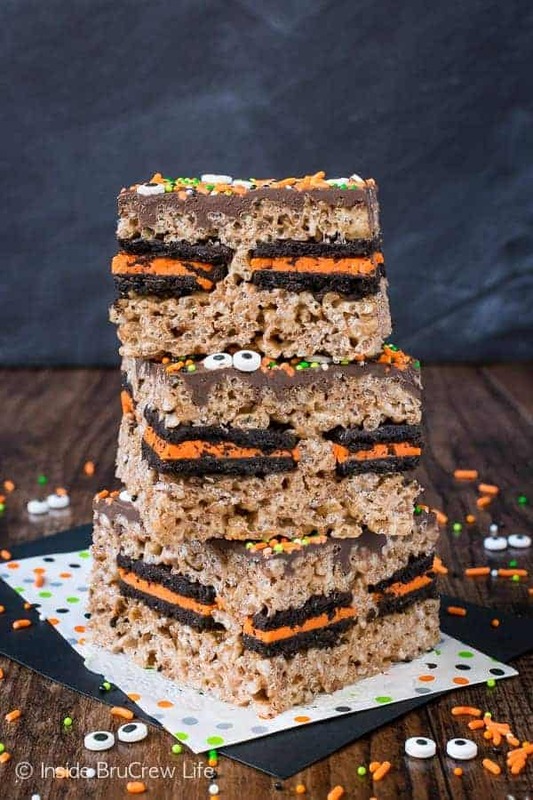 A hidden layer of cookies makes these Halloween Oreo Stuffed Rice Krispie Treats a fun fall treat. 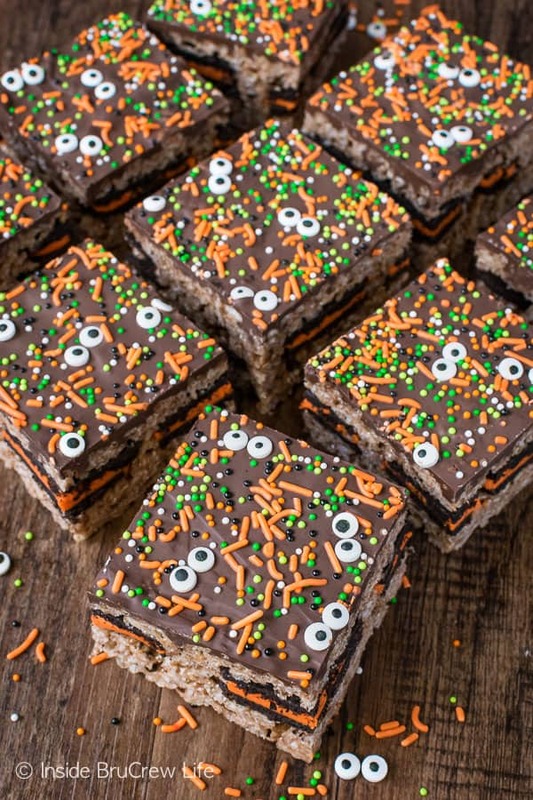 These easy no bake bars are the perfect dessert to make for fall parties or bake sales. Do you decorate your home for fall or Halloween? I’m just curious how many people are like me. As soon as fall gets here I can’t wait to pull the totes out of the attic and to decorate our shelves and tables with leaves and pumpkins. Now that October is here, I need to pull those totes out again and add the skeletons, bones, and spooky decor to my fall pumpkins. This is also the month that I boycott dusting. I feel that the layer of dust adds to the spooky atmosphere I’m going for. At least that’s what I’m telling myself. 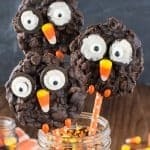 I love coming up with fun and exciting Halloween recipes. Bring on the googly eyes, right? Of course, lately I have been busting out the candy eyes for every holiday. 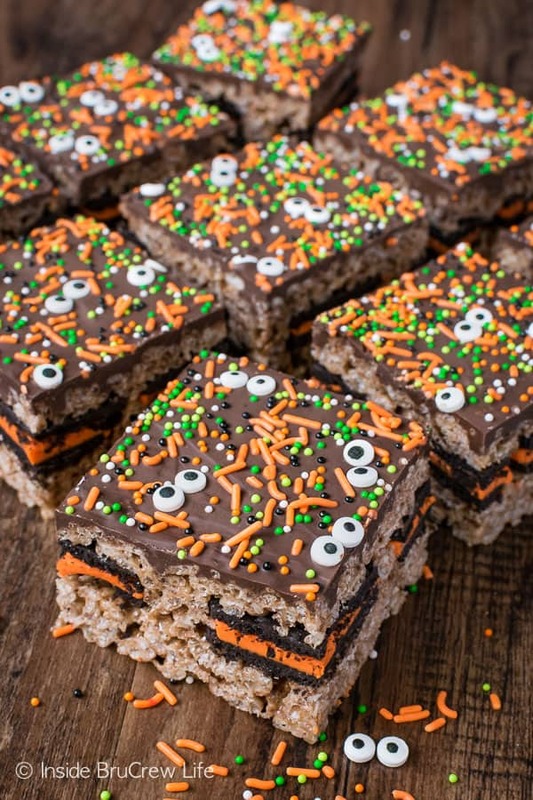 These is something about rice krispie treats that I just adore. I don’t know if it’s the gooey marshmallow or the fact that you can make them in minutes that makes me happy. I just know that I will always choose a rice krispie treat if it’s put in front of me. 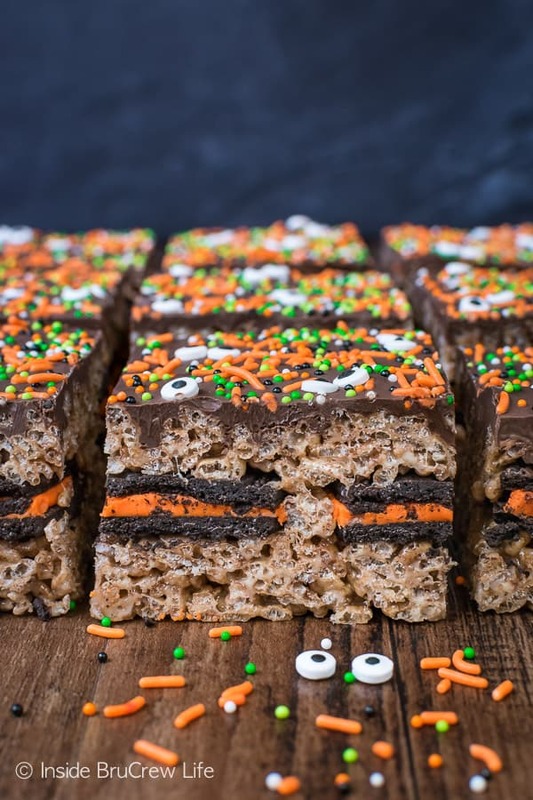 Growing up and up until a few years ago, I always made classic rice krispie treats. It’s a staple that everyone loves, right? Well, then I decided to get crazy with the krispies. 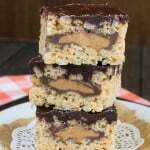 A few years ago I made these Peanut Butter Cup Rice Krispie Treats and everyone went bonkers for the hidden layer of candy bars. I get it. 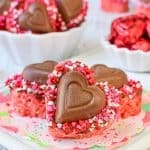 They are pretty fabulous and pretty much the best rice krispie treat ever! But I did’t stop there. 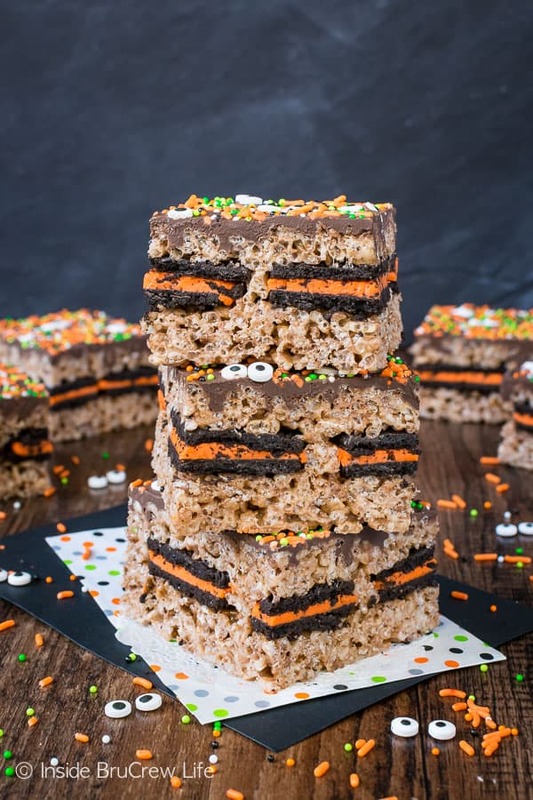 I also made these Oreo Stuffed Rice Krispie Treats with lots of sprinkles, and now I am officially hooked on adding layers to all the rice krispie treats! So as soon as I saw the Halloween Oreos at Target, you know what I had to do, right? Yup, another stuffed rice krispie treat. It was meant to be! 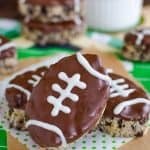 It’s kind of hard to tell in the pictures, but I used a box of cocoa krispies for these easy no bake treats. The marshmallow kind of tones down the chocolate color. That’s ok though because then the bright orange frosting from the cookies stands out even more! Line your pan with foil or parchment and then use soft butter to coat the bottom really well. This will keep the krispie treats from sticking. Count out 24 cookies and have them ready to place in the center of the no bake treats. Melt the butter and marshmallows in a large pot until everything is melted and gooey. Stir in the cocoa krispies and stir until they are coated. Press half the mixture into the bottom of the prepared pan using a piece of parchment paper. Place the cookies on top of the cereal layer leaving a little bit of space around each one. Spoon the rest of the mixture on top of the cookies. Use another piece of parchment paper to press the mixture down. Make sure to get the mixture in between the cookies if you can. Let it cool. Melt the candy melts according to the package directions and pour it on top of the cooled treats. Add sprinkles and googly candy eyes before it sets up. 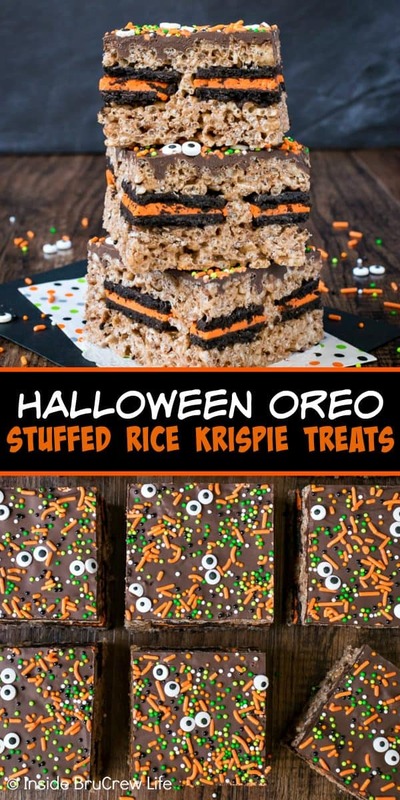 Cut these Halloween Oreo Stuffed Rice Krispie Treats into large or small squares and watch them disappear in a hurry! Why do you line your pan with foil? I like to lift the rice krispie treats out of the pan as one giant rectangle, then cut them into squares. 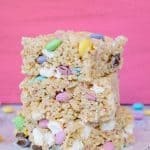 Can I make the rice krispie treat mixture in two batches? Yes, you can melt half the butter and marshmallows first, then stir in half the rice krispies cereal. Press all of this into the buttered pan. Then repeat with the second half. Do I have to use Oreo cookies? No. You can use whatever cookie floats your boat. Or leave them out entirely. It’s totally up to you. 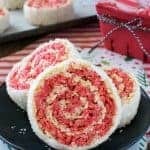 Can you freeze rice krispie treats? Yes, you can. Make sure you wrap them very well in saran wrap, then place in a freezer ziplock bag. Set them out a few hours before you want to serve them. The colors on the sprinkles and chocolate may change colors though. Do I have to put the chocolate on top? Yes, only aliens skip extra chocolate. Just kidding. No, you can leave off the extra chocolate if you like. You just won’t have anywhere to stick the sprinkles. Line a 9x13 pan with foil. Use soft butter to lightly coat the bottom of the pan. Place the marshmallows and butter in a large pot over low to medium heat. Stir until melted and creamy. Stir in the rice krispies cereal until everything is coated. Press half the cereal mixture into the bottom of the prepared pan using parchment paper. Place the 24 cookies on top leaving a little bit of room around each on. Spoon the rest of the cereal mixture on top and press down with more parchment paper. Make sure to get some for the cereal down in between each cookie. Let cool. Melt the bag of chocolate melts according to the package directions. Pour on top of the cooled treats and spread out evenly. Top with sprinkles and candy eyes before it sets. 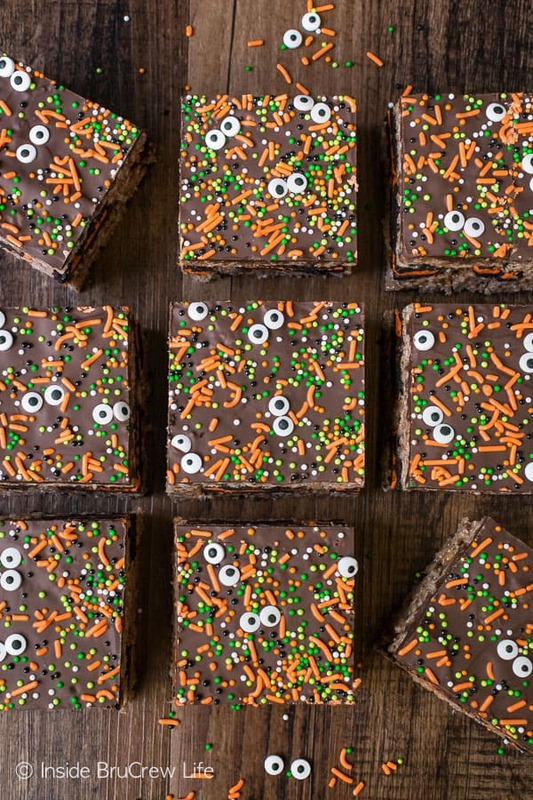 Let the chocolate set, then cut the rice krispies treats into 24 squares. Store in a tightly sealed container.